Nothing says “summer” like the most quintessential, all-American holiday. The 4th of July celebrates America with great pomp and grandeur – it’s a special day unlike any other, and people all over the country make the most of it by firing up the barbecue and watching the spectacular fireworks light up the darkening sky. Whether you’ve got grand plans for the big day – maybe you’re hosting the big neighborhood party that everyone looks forward to all year – or you’re headed to someone else’s event, you’ve got to be prepared. Peruse these fun and thoughtful gift ideas that will make the celebration even more special. No doubt about it: it’s going to be hot. 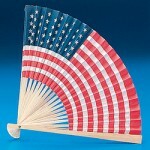 No matter where the day takes you, these USA flag fans will ensure that everyone in the group is at least moderately comfortable even when the air feels thick and soupy. And what better way to really show some patriotism than with a fan emblazoned with the stars and stripes? Toby Keith was on to something when he paid musical homage to the esteemed red Solo cup. 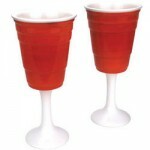 This pair of red cup wine glasses is sure to draw a chuckle from the crowd – it’s fancy without being fancy at all, offering you a unique and fun way to serve up an ice cold brew to guests. 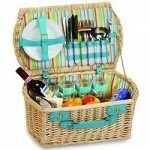 If it’s a strictly family occasion, the Brandyn picnic basket for four is a must of epic proportions. The pretty carryall contains everything the gang needs to make their outdoor feast a success, from plates and cutlery to goblets and napkins. How sweet it is! Forgo the usual dessert suspects in favor of something more festive. 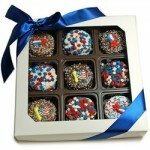 This box of patriotic Oreos contains nine delicious cookies dipped in rich, creamy Belgian chocolate and decorated with an array of red, white and blue decorations and icing.